Around midday on Friday, the Mexican Diabetes Association opened its tent, donated by Direct Relief, at the edge of Pushkin Park in Mexico City, where free glucose tests, doses of insulin, and free teeth cleaning (diabetes is closely linked to dental and periodontal health) were provided for anyone in need. Situated at the edge of the well-to-do Roma neighborhood, one of the hardest hit in the devastating 7.1 earthquake that struck central Mexico on Tuesday, Pushkin Park has, for the last three days, been the site of a collection center, one of many set up around Mexico’s capital providing hot food, water and medication to the thousands of people displaced by the earthquake. Gabi Allard, president of the association, said that staffers spent the better part of Saturday afternoon moving around the city, particularly the south, collecting insulin to administer to diabetics who had either lost their homes in the widespread devastation, or who could not reenter them due to structural damage. The association itself has been temporarily displaced from its headquarters nearby. In Parque Pushkin, Allard pulled out her phone to show pictures of cracks in the office walls. “There was no way we could stay there and continue to serve people,” she said. Using a van also donated by Direct Relief, the association has been able to move its essential equipment out of the offices and into the public sphere. According to Allard, Mexico is home to as many 14 million diabetics, roughly 2 million of them residents of Mexico City. “If you have this kind of stress, then people don’t control their diabetes, and that’s when they really start to feel ill,” she said. As the afternoon wore on, families of volunteers, drawn by an association staffer announcing the team’s services over a megaphone, came by to test their blood sugar. Others who had not been able to return to their homes in three days came to have their teeth cleaned and to collect free toothbrushes and floss, essential habits to reestablish some sense of normalcy in uncertain times. By Friday afternoon, life in some parts of Mexico City had already started returning to normal. In the historic center, which avoided the worst of the earthquake’s effects, shopkeepers had come back to work and street vendors hawked ears of corn off the grill. Even in Roma, where several buildings collapsed and many others suffered permanent damage, cafés and restaurants had opened for business. But destruction was never more than a few blocks away. Some businesses continued to offer their bathrooms, wifi and power outlets along with free meals, coffee and ice cream to displaced people and the volunteers who continued to flock to the sites of major building collapses, waiting patiently in hard hats and orange vests to take their turns clearing the rubble. Emilia Dionisio had come in to the city center from her home in the lower income districts to the north. Built on solid bedrock in the surrounding hills, Mexico City’s poorer neighborhoods suffered far less damage than better-off areas built on the unstable terrain of the city center. “I don’t have any money to give, but I wanted to help in any way I could,” Dionisio said. 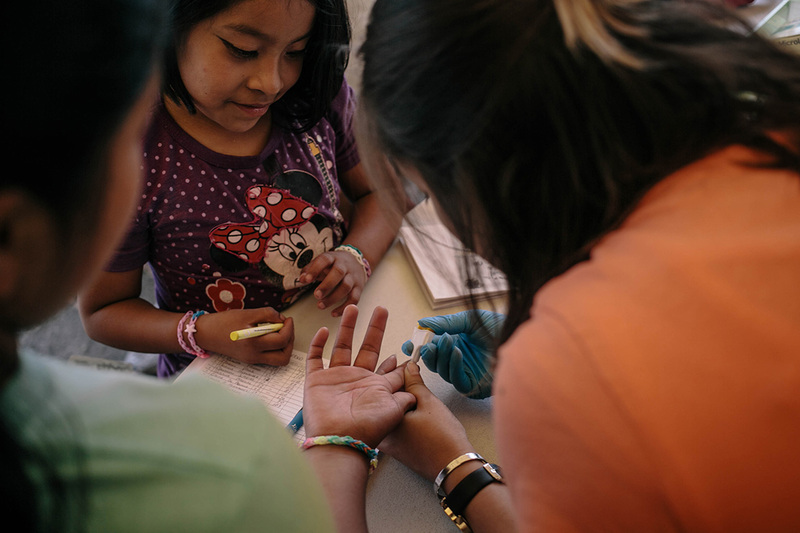 Once at the park, she decided to come take advantage of the association’s services, an important part of the organization’s efforts to spread awareness about a disease that, particularly in urban Mexico, has reached epidemic proportions. Having now received substantial insulin donations, Allard plans to use the Direct Relief-donated facilities on Parque Pushkin to organize treatment and dispense it to those in need while also disseminating information to the many city residents who still know little more than myths about diabetes. Allard plans to have staff on site throughout the coming week from 9 a.m. until 7 p.m. – later if need be. A woman who goes by the name Quetzaltlahuitli – Nahuatl for “beautiful light” – came through the tent with her daughter shortly after Dionisio had left. Residents of Iztapalapa, another outlying district built on bedrock, they had spent the previous three days volunteering. – Michael Snyder is a journalist based in Mexico City.